Assorted Boxed Chocolate are available in 1/2#, 1#, 2#, and 3# sizes. Great item for shipping and gifting. It contains almond bark, coconut clusters, peanut butter cups, caramels, tortoise, peanut clusters, almond toffee, raising bark, and puff 'n' stuff. 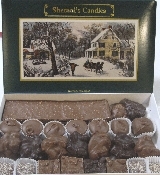 Assorted Boxed Chocolate are available in 1/2#, 1#, 2#, and 3# sizes. Great item for shipping and gifting. Assorted Chocolate Party Trays are available in 2#, 3#, and 4# sizes and are great for parties or corporate gifting. They contain almond toffee, peanut butter cups, caramels, tortoise, peanut clusters, coconut clusters, raisin bark, puff 'n' stuff, mini pretzels, and potato chips. Assorted Boxed Chocolate are available in 1/2#, 1#, 2#, and 3# sizes. Great item for shipping and gifting. It contains almond bark, coconut clusters, peanut butter cups, caramels, tortoise, peanut clusters, almond toffee, raising bark, and puff 'n' stuff. Assorted Chocolate Party Trays are available in 2#, 3#, and 4# sizes and are great for parties or corporate gifting. They contain almond toffee, peanut butter cups, caramels, tortoise, peanut clusters, coconut clusters, raisin bark, puff 'n' stuff, mini pretzels, and potato chips. Assorted Boxed Chocolate are available in 1/2#, 1#, 2#, and 3# sizes. Great item for shipping and gifting. It contains almond bark, coconut clusters, peanut butter cups, caramels, tortoise, peanut clusters, almond toffee, raising bark, and puff 'n' stuff.